Princeton University’s campus dining serves more than three million meals a year to its students through their residential dining halls, campus-wide athletic banquets, food truck, reunion activities, and a host of other campus events. And the woman who presides over this humungous catering operation is Smitha Haneef, the India-born director of campus dining at Princeton who went to Harvard’s leadership and management institute for study. Recently, the Ivy League university released a vimeo entitled, “Princeton Campus Dining Nourishes People And Planet” that features Haneef extolling the virtues of campus dining and how the university cares for students through healthy “plant forward” menus. The university’s student group, Greening Dining, partners with Haneef to “foster a culture of health and sustainability throughout campus food programs,” according to the website. “In my experience, a healthy meal is something that has lots of plants and legumes and beans and grains, that when you eat you feel nourished and ready to go to take on whatever the next goal is in your life,” Haneef says in the vimeo. Haneef’s love for cooking, catering and food management dates back to the time when the Orissa native lived in Hyderabad, studying for a degree from the National Council for Hotel Management and Catering Technology. 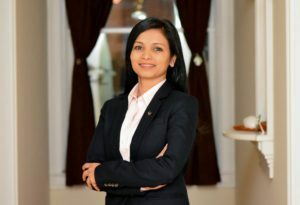 After school Haneef, who is a graduate of Osmania University, worked at various five-star hotels and restaurants in India before moving to the U.S. in 2000 where she had her own restaurants as owner and chef. She later moved on to corporate dining, and designing global food programs for companies like Google, Nike and Cisco systems. She also established partnerships with community organizations and global food programs to educate guests about healthy and socially responsible food choices. “All along I have worked in hotel management and food-related jobs which, needless to say, I have a deep passion for,” Haneef said. That passion keeps her going at Princeton where, on any given day, at least 18,000 meals are served to the on-campus student community, which she overseas with the help of a dedicated team including procurement people, managers, and chefs who prepare about 100 food items a say. “On our campus, there are students from all different ethnic and cultural backgrounds, and naturally their culinary habits, their food preferences are not the same. Our goal is to cater to their tastes, keeping in mind their overall health and nutritional requirements,” she told Desi Talk. Campus dining food program at Princeton integrates wellness and sustainability principle based on scientific research and evidence. Although she would not like to be quoted specifically on the issue, Haneef admits that there is a correlation, according to various scientific researches, between eating healthy foods and academic performances. Haneef is directly responsible in maintaining the university’s commitment to serving nutritious and sustainable food and collaborates with campus partners to develop new dining initiatives. “The millennial preference is like ‘keep me nourished on-the-go.’ It’s a very demanding lifestyle with longer days, and through the day, they want to have an exciting meal, which means giving them daily nourishment but exposing them to different trends,” Haneef had told Princeton Alumni Weekly in 2014, soon after joining Princeton as executive director of campus dining. She said her role involves a lot of planning in terms of manpower, menu selection not just for the campus dining but also for the eight presidential dining halls, guest house for visiting dignitaries, retail outlets and food trucks and various coffee stands. Those are the things she spends most of her time on, although she devotes a good amount of time listening to students, and learning from them when she walks through various dining halls to get feedback. During the academic year, Haneef spends six days a week on campus, overseeing dining and catering. What does it take her to do what she does? “My unflinching love and passion for service through food! After all, how we nourish and nurture our students is always at the core of my heart,” Haneef who lives in Princeton with her son, and husband who is an information technology professional, said. Haneef, who went to Institute of Leadership and Management at Harvard Graduate School of Education, said answering a question that one of the reasons that motivated her to join Princeton was that she wanted to see how higher education looks at food. Noting that diversity in cuisine is important on a university campus like its student population, she said that she has found that food is definitely a common platform within the higher education community for the students to come together, and that in some ways leads to understanding of different cultures and expansion of knowledge.